Beethoven wrote his famous Ninth Symphony in 1824. It is still recognized around the world almost two centuries later as one of his greatest masterpieces, if not his greatest. It was the first time anyone had used a major vocal component in a symphony which, I might add, was no easy subject for him to pull off. Found penned in one of his sketch books after the renowned Maestro died were these words, “Let us sing the ode of the immortal Schiller”. Thus, The Ode to Joy, also known as The Song of Joy, marched into history to remain forever a part of Beethoven’s famous symphony. Folks, this illustrated book on Robert Burns will do the same. 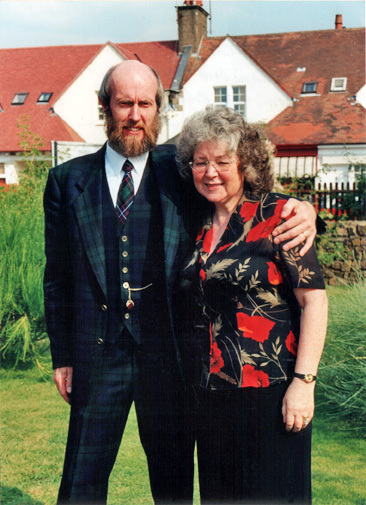 Hunters’ Illustrated History of the Family, Friends and Contemporaries of Robert Burns by Colin Hunter McQueen and Douglas Hunter is a book of joy. I do not consider myself an authority on books, but I enjoy them as much as anyone (as my library of several thousand Scottish books will attest). This book goes to the top of my list. 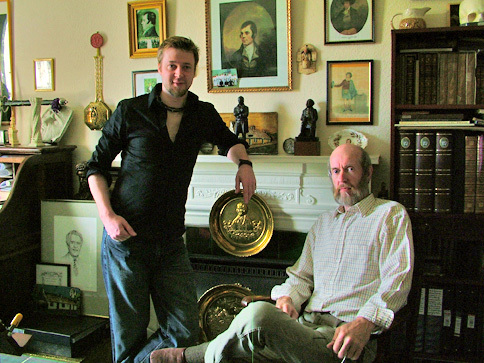 As Beethoven did with his Ninth Symphony, this father-and-son team has produced a work with more artistic detail and new facts about Robert Burns than any book of which I am aware. I purposely chose the illustration of Beethoven’s Ninth Symphony because this book is vividly picturesque and the scholarship is refreshing. Simply put, it is awe inspiring! Both Beethoven and the Hunters went against the grain and did something that had never been done before. Oh, I’m sure there are some books out there equally as good with their artistry, but I have never seen one with so many beautiful drawings (over 600 illustrations). More than likely those out there are not readily available to the public but are hidden away in a library vault, probably reserved for the eyes of the biggest donors, while this one will be available to one and all if you are lucky enough to purchase a copy of the two thousand copies to be published. 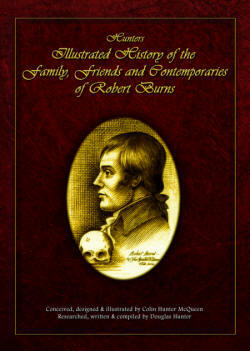 This book is a heart-warming tribute to Robert Burns. Scholars will be excited by this book, and lay people like me will just simply enjoy it – immensely. There will be no disappointment for our readers when they hold the book in their hands and lovingly go through it page by page. Move over Maurice Lindsay and your two editions of The Burns Encyclopedia, there is a new book in town! 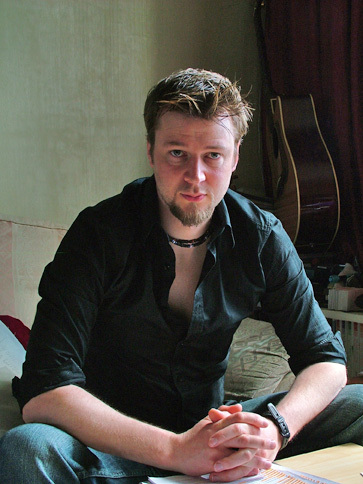 Colin Hunter McQueen is a gifted artist, and his son Douglas is equally gifted as a writer. Please keep in mind that the text complements the drawings. What they have done is made me revise my list of the top five books I would like to have if marooned on an island. This 300-page book is a work of fulfillment, joy, and love that stretches over many years. It was conceived, designed, and illustrated by Colin. The book was researched, written and compiled by Douglas. This Hunter team has freed Burns from some past interpretations with the artistry of one and the research and scholarship of the other. Robert Burns will be better appreciated and will come alive in our global society. What they have done reminds me of an anecdote I heard years ago about another great artist, Michelangelo. It is said he would look at a giant piece of marble and could be heard uttering, “There is an angel in there I must set free”. These two men have done the same with Robert Burns. Beethoven’s Ninth Symphony with Schiller’s Ode to Joy, has officially been adopted as the national anthem for the European Union. Hunters’ Illustrated History of the Family, Friends and Contemporaries of Robert Burns, in its own right, will become “An Ode to Joy” for Burnsians and non-Burnsians alike. 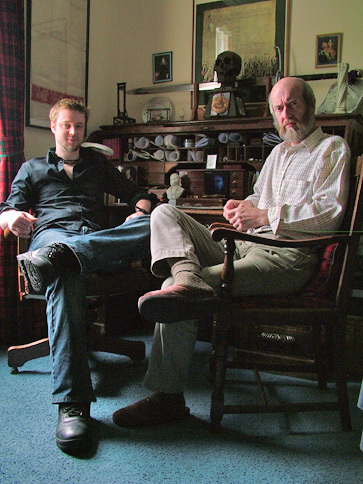 It is truly a book of love and joy by father and son that presents a rare up-to-date tribute to our National Bard. 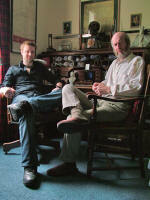 See A Chat with Colin and Douglas Hunter to see some sample pages from the book.